In a world filled with out-of-school time options for young adults, new research from the Center for Adolescent Research and Education (CARE) in collaboration with Coastal Carolina University points to the enduring, and positive, outcomes of leadership training for teens in both traditional and specialty camp settings. According to the responses of youth ages 14–17, their camp experiences yielded significant leadership-related gains in such areas as personal growth, independence, innovation, responsibility, teamwork, and business and social entrepreneurship. “‘In the beginning,’ so goes many a great story. These familiar words beckon us across a threshold, often transporting us into unknown worlds and novel experiences. So too our lives are filled with many such ‘beginnings’ — new jobs, relationships, adventures, and even the inception of life itself. Each of these ‘threshold experiences’ not only introduces us to new domains, but also draws us into the realities of archetypal fields. Learning to creatively interact with these prefigured, a priori fields can allow us rich access to sources of eternal wisdom” (Conforti, 2007). As young people navigate transition, such as from middle to high school and high school to college, they sometimes experience difficulties, doubting their own abilities to successfully set and achieve goals, be they social, emotional, educational, or vocational. Helping youth in transition has been a key focus of CARE and of The Jed Foundation (JED), which says, “Transitioning into adulthood can bring big changes and intense challenges. JED empowers teens and young adults with the skills and support to grow into healthy, thriving adults” (The Jed Foundation, 2018). In many ways, such transitions may include “threshold experiences,” or “threshold concepts.” According to Jan Meyer and Ray Land of the ETL Project (which focuses on enhancing teaching-learning environments), “A threshold concept can be considered as akin to a portal, opening up a new and previously inaccessible way of thinking about something. It represents a transformed way of understanding, or interpreting, or viewing something without which the learner cannot progress” (Meyer & Land, 2003). Threshold concepts are many things, including troublesome (especially when counterintuitive or alien), irreversible (they cannot be unlearned), integrative (individuals can integrate new concepts with old knowledge), and liminal (giving the individual new space to traverse). Perhaps most notably, they can be transformative, allowing the individual to see things in new ways (Meyer & Land, 2003). Doenmez goes on to say, “As educators, we tacitly understand liminality as part of the learning process. And yet we probably leave it up to our students to deal with the discomfort of liminality on their own or gloss over it. Often teachers encourage students to minimize their uncertainty and confusion, exhorting them to show grit, to push through this stage to a resolution . . . Students must dwell in the discomfort and find their own routes to a next stage of understanding. As teachers, we need to affirm the feelings students experience, create time and exercises for them to make sense of their experience, encourage persistence, and reward them for the process of learning. We also need to help students see their progress and voice the changes they are undergoing. When we legitimize and value their struggles and walk with them through these passages, we are helping students undergo transformation” (Doenmez, 2018). How else can we, as summer teachers, help young people through these transformative times? Also helpful to those mentoring youth is JED’s focus on basic life skills, social and emotional skills, and mental health/substance abuse literacy. Each suggests key challenges and the need for assistance and support. They also form the basis for JED’s new “Set to Go” initiative, a curriculum that helps high school students successfully navigate their next step after graduation (Set to Go, 2018a). Finally, with regard to mental health/substance abuse literacy, JED offers, “During the teen and young adult years, it is not uncommon for emotional and substance use problems to appear. Therefore, it is really valuable for both you and your child to be able to identify the factors that can support emotional health and the indications that trouble may be emerging” (Set to Go, 2018b). Similar themes appeared in our work with Camp Rising Sun (CRS) to analyze data they collected from campers over the course of many summers. In our 2015 Camping Magazine article “The Consequence of Character: How Summer Camp Promotes Character, Leadership, and Entrepreneurship,” we cited that data and reported the following. “In assessing the impact — across multiple domains of development — of a seven-week selective international leadership program for gifted adolescent boys and girls, CRS found that experiential learning about leadership, diversity, and sensitivity to the needs of others resulted in important personal advances in tolerance, global awareness, self-confidence, sensitivity, relationships, and development of lifelong interests” (Mischel & Wallace, 2015). That research, conducted by SurveyTelligence, Inc. for CARE, noted the work of youth social entrepreneurs who present as both oriented on people and values, sharing with their business entrepreneur counterparts an ability to identify the resources to get things done. The findings also revealed key variables statistically tied to entrepreneurial interest and behavior, including having family responsibility in childhood (such as household chores and taking care of younger siblings) and receiving information from elders. Not insignificantly, the traits of both social and business entrepreneurs — taken in totality — represent the type of “noncognitive skills” employers say they are looking for, such as civic literacy and global competence (P21, 2018). According to the American Camp Association (ACA), “For more than 150 years, camp has been changing lives — allowing all children to feel successful, especially those who may struggle with traditional educational settings. Camp is full of fun and excitement, but it is so much more — developing children who are better equipped to lead in the 21st century with skills such as independence, empathy, the ability to work as part of a team, and a broader world view.” ACA adds that camps are also safe, nurturing places where children improve their social skills and gain self-confidence (American Camp Association, 2018). Indeed, our 2015 data indicated, “Study participants who attended a summer camp were significantly more likely to state an interest in social entrepreneurship than those who had not attended. Why? They cited the influence of counselors, especially in mentoring them to develop social and leadership skills; assisting them in obtaining social and material resources to start new projects; and guiding them in understanding such projects and identifying other mentors. Young people who had started their own businesses or were highly interested in doing so were especially influenced by camp counselors who taught them how to gather resources needed to achieve goals” (Mischel & Wallace, 2015). Data collected from more than 100 youth attending two summer camp leadership programs during the 2018 season provided some interesting insights. For example, campers believed that, as a result of their leadership training, they gained a better understanding of their own skills and how to manage themselves and others. They also identified themselves as more entrepreneurial in business and more inclined to engage in social entrepreneurship. Finally, they indicated they were more competent, independent, and team-oriented. These outcomes confirm that summer camps produce better leaders. Activities that promote such outcomes include counselors allowing campers to take on additional responsibilities (through leadership roles and team-building exercises) and encouraging the campers to reflect on those experiences throughout their stay. Campers might take part in sharing skills they know and teaching them to others, or they may be challenged to complete a physical or mental task they thought was not possible. Camp experiences should expose individuals to new challenges and stretch their abilities to go beyond their comfort zones. In doing this, campers increase their confidence levels and their ability to work with others in a team. Focus on values and expectations. 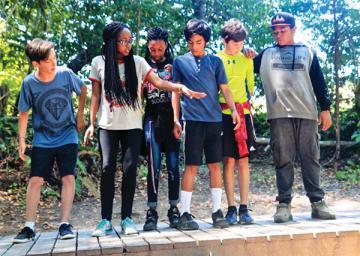 Camp owners and directors bear huge responsibility for “delivering the goods” by way of impactful summer learning experiences, perhaps uniquely for teens whose parents may have other ideas in mind. For them, rethinking summer can hold real, and tangible, potential. That is why camp remains relevant for teens. Center for Adolescent Research and Education. (2018). CARE. Retrieved from ecareforkids.org. Conforti, M. (2007). Threshold experiences: The archetype of beginnings. Mystic, CT: Assisi Institute Press.